Aberrant activation of the Hedgehog (Hh) signaling pathway in different organisms has shown the importance of this family of morphogens during development. Genetic screens in zebrafish have assigned specific roles for Hh in proliferation, differentiation and patterning, but mainly as a result of a loss of its activity. We attempted to fully activate the Hh pathway by removing both receptors for the Hh proteins, called Patched1 and 2, which are functioning as negative regulators in this pathway. Here we describe a splice-donor mutation in Ptc1, called ptc1 hu1602 , which in a homozygous state results in a subtle eye and somite phenotype. Since we recently positionally cloned a ptc2 mutant, a ptc1;ptc2 double mutant was generated, showing severely increased levels of ptc1, gli1 and nkx2.2a, confirming an aberrant activation of Hh signaling. As a consequence, a number of phenotypes were observed that have not been reported previously using Shh mRNA overexpression. Somites of ptc1;ptc2 double mutants do not express anteroposterior polarity markers, however initial segmentation of the somites itself is not affected. This is the first evidence that segmentation and anterior/posterior (A/P) patterning of the somites are genetically uncoupled processes. Furthermore, a novel negative function of Hh signaling is observed in the induction of the fin field, acting well before any of the previously reported function of Shh in fin formation and in a way that is different from the proposed early role of Gli3 in limb/fin bud patterning. The generation and characterization of the ptc1;ptc2 double mutant assigned novel and unexpected functions to the Hh signaling pathway. 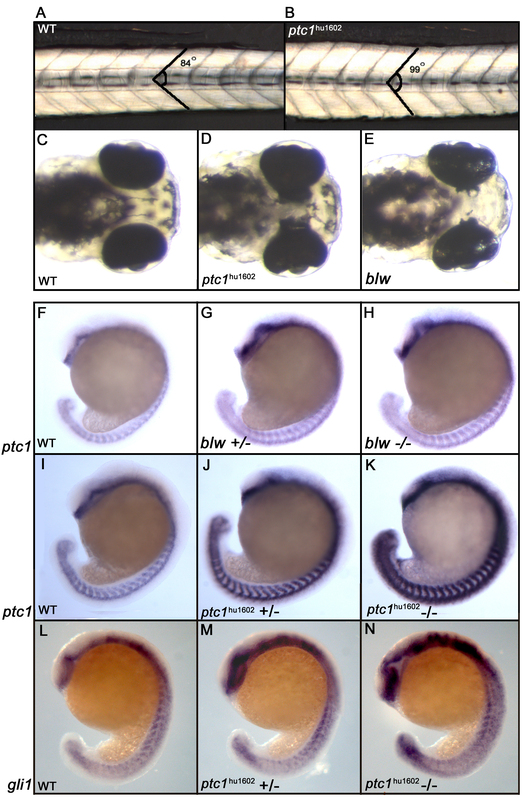 Additionally, these mutants will provide a useful system to further investigate the consequences of constitutively activated Hh signaling during vertebrate development. The Hedgehog (Hh) signaling pathway has been the focus of much research in the last two decades, highlighting the importance of this morphogen in the control of patterning, differentiation and proliferation during development and disease [1–3]. The consequences of aberrantly activated Hh signaling have been identified using forward and reverse genetic approaches in vertebrates and invertebrates. Large-scale genetic screens using zebrafish identified mutants encoding several components of the Hh signaling pathway, like Shh , Smo , Gli1 , Gli2 , Dispatched , dzip1 [9, 10] and Scube2 [11, 12]. Mutants of the Hh pathway were mainly identified morphologically by their effect on somite development, as they resulted in U-shaped somites. This defect probably results from the absence of adaxial cells or muscle pioneers in the mutant myotome . The proteins encoded by these mutants are mainly positive regulators, where inactivating mutations result in an inhibition of the pathway. Recently, we showed that a class of mutants consisting of dre, uki and lep, encode the negative regulators of Hh signaling, Sufu, Hip, and Ptc2, respectively . These mutants show an increased level of proliferation in different tissues but do not show the usual patterning defects described for Hh overexpression experiments. The slight activation of Hh in these mutants did not result in similar defects as seen by ectopic expression of shh  or dnPKA , morphologically resulting in flattened somites. Additionally, optic cup vs. stalk differentiation defects , dorsoventral patterning of the brain  and neural tube (for a review: ), are described to be controlled by Hh signaling. None of these phenotypes could be observed in the dre, uki or lep mutant. Triple mutants for Sufu, Hip and Ptc2 did not show an enhanced phenotype, suggesting that additional regulators are still functioning to inhibit the Hedgehog pathway, most likely Ptc1 . A well-described role for Hh signaling during development involves the specification of the myotome in fast and slow muscle type fibers (for a review: [20, 21]. Overactivation of the Hh signaling pathway by shh overexpression, results in a complete conversion of the myotome into slow muscle cells, at the expense of fast muscle cells [16, 22–25]. The exact genetic program controlled by Hh, underlying this specification, is still largely unknown. Positional cloning of the ubo mutant, a member of the u-type mutant class, shed some light on this regulation. It was found that this locus encodes Prdm1 (previously described as Blimp-1) . This gene is a downstream target of Hh signaling  and can act as a transcriptional repressor . Ectopic prdm1 expression is able to rescue slow muscle development in smu mutants, completely lacking Hh signaling , indicating a pivotal role for Prdm1 in specifying slow muscle cell identity. Besides its role in specification and differentiation of muscle cell identity, a well-established role for Hh involves the regulation of A/P patterning of the outgrowing fin buds. The fin buds arise from specified regions of the lateral plate mesoderm (LPM) by a cascade of different genes. One of the earliest factors involved in fin field induction is Vitamin A derived Retinoic acid (RA), produced by Aldh1a2. Gibert et al, , have shown that RA produced in the somitic mesoderm is necessary during early segmentation (6 to 8 somite stage) for proper fin induction. The RA signal is thought to be transferred to the intermediate mesoderm where it activates Wnt2b . Subsequently, the T-box transcription factor tbx5 , one of the earliest genes known to be expressed in the fin field, is induced in the LPM under control of wnt2b . In the fin mesenchyme, tbx5 induces, among other genes, fgf24, fgf10 and prdm1 expression to further specify the fin primordium. fgf24 induces the expression of shh in the posterior mesenchyme of the fin bud  called the zone of polarizing activity , which organizes the A/P patterning of the outgrowing fin. The importance of Hh for zebrafish fin development became apparent in the syu and smu mutant that encode Shh and Smoothened, respectively. These mutants do form fin buds, but subsequently fail to grow out correctly [5, 35]. On the other hand, a slight activation of Hh signaling, as described for the uki hu418 b mutant, results in enlarged pectoral fins, probably as a result of increased proliferation within the developing fin bud . These data show that Hh is functioning rather late in the genetic program controlling pectoral fin development. Here we describe the identification of two ptc1 alleles, showing subtle Hh overexpression phenotypes, affecting eye and somite development. In contrast, zebrafish mutants for both ptc genes show severe developmental problems, indicating redundancy between the two Ptc homologues. We find that constitutive activation of Hh signaling negatively regulates the induction of the pectoral fin field. The Hh signaling pathway therefore acts significantly earlier in fin field induction than its well-described role in A/P patterning of the outgrowing fin bud. Additionally, a negative role for Hh signaling in the specification of A/P patterning of the somites is observed, where somites of the ptc1;ptc2 mutants appear to be apolar, without affecting segmentation. This is the first evidence that A/P patterning and segmentation are uncoupled processes. The described mutants assign novel roles to Hh signaling during development and will be of major importance for further studies focusing on the effects of constitutive activation of Hh signaling during development and disease. The dre, uki, and lep mutant class has shown that multiple regulators secure the activity of the Hh signaling pathway. This was illustrated by the fact that the concurrent loss of function of the negative regulators Sufu, Hip and Ptc2 did not result in the typical Hh overexpression phenotype, mainly concerning the chevron shape of the somites . Presumably, the slight increase in Hh signal is enough to increase Ptc1 expression via a sensitive auto-regulatory loop, thereby maintaining the pathway at a certain level of activity, which does not exceed the threshold for Hh activation that will lead to patterning defects. To test this hypothesis we have generated a target-selected knockout of the Ptc1 gene. An ENU-induced mutation library of approximately 12,000 F1 fish was screened for mutations in this gene using the TILLING method . This resulted in the identification of a splice donor mutation, changing the 5' consensus sequence of the intron after exon 10, from GT, to AT (Fig. 1A, referred to as ptc1 hu1602 ). 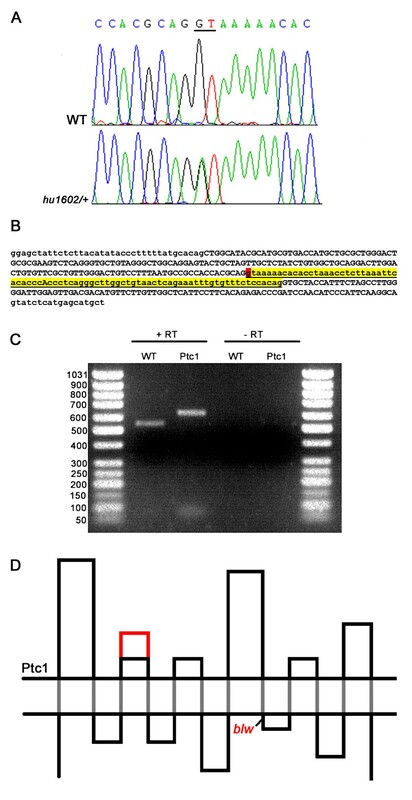 The removal of this splice site results in the insertion of the 81 bp intron into the transcript (Fig. 1B). RT-PCR (Fig. 1C) and sequencing experiments on a fragment containing exons 10 to 13 confirmed that this complete intron is inserted in frame into the ORF, resulting in an expansion of the second extracellular loop of the Ptc1 protein by 27 amino acids (Fig. 1D). 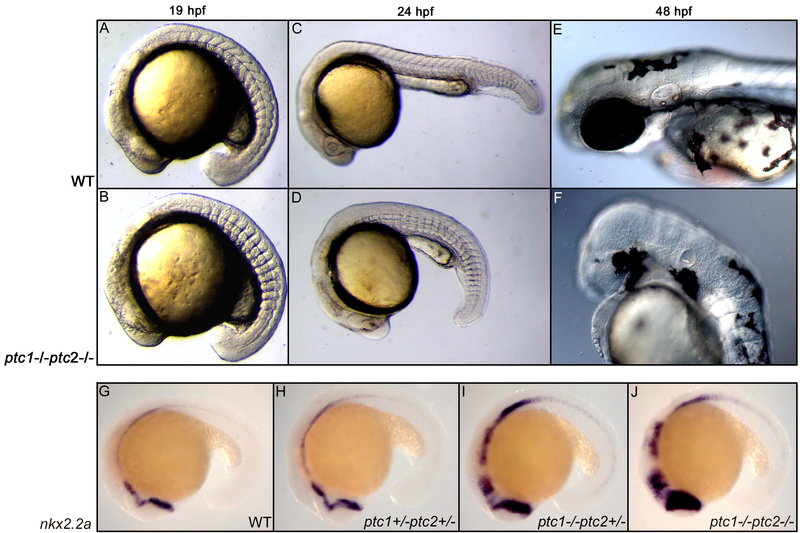 Identification and characterization of a splice-donor mutation in the zebrafish ptc1 gene. A splice donor mutation was identified in the first base pair of intron 10, changing the consensus sequence GT to AT, probably affecting splicing (A). The intron after exon 10, shown in lower case in yellow, contains 81 bp, and the splice donor position mutated in ptc1 hu1602 is indicated in red (B). RT-PCR analysis confirms that splicing is affected as a result of the mutation, which extends the transcript with 81 bp compared to wild type (C). Schematic representation of the Ptc1 protein, showing the 12 transmembrane domains (black dots), and the extension of the second extracellular loop with 27 AA in red. The blw mutation is positioned directly after the eighth transmembrane domain of the protein (D). Zebrafish homozygous for ptc1 hu1602 display a subtle somite phenotype at 32 hours post fertilization (hpf), where the angle of the chevron shaped form of the somites becomes more obtuse (Fig. 2A,B). The average angle of the somite is 84° in a wild type situation (n = 6, 4 somites measured), compared to 99° for the ptc1 hu1602 mutant (n = 6, 4 somites measured). However, the typical flattened somite phenotype, as observed after Shh overexpression in zebrafish, was not observed, probably due to redundancy with Ptc2. Additionally, at 72 hpf a partially penetrant eye phenotype is observed, where the retinal pigmented epithelium (RPE) extends into the diencephalon (Fig. 2C,D). This phenotype has already been described for the blowout (blw tc294z ) mutant , suggesting that blowout may also be a mutation in ptc1. Complementation analysis indicated that ptc1 hu1602 and blw tc294z are allelic (data not shown). Subsequent sequence analysis of all exons of ptc1 identified a premature stop codon (W1039X) in the blw tc294z allele, located after the eighth transmembrane domain (Fig. 1D). Comparing ptc1 hu1602 with blw tc294z revealed that ptc1 hu1602 has a higher penetrance of the eye phenotype (21.4% in total, 3.4% single eye, 18% both eyes affected, n = 261) than blw tc294z (5% in total, 4.4% one eye, 0.6% both eyes, n = 521). Additionally the RPE in the ptc1 hu1602 extends more severely into the diencephalon of the embryo compared to blw tc294z (Fig. 2E), suggesting that the ptc1 hu1602 allele is stronger. As transcription of ptc1 is known to be upregulated by increased Hh signaling, we decided to test whether our mutations resulted in an increase in ptc1 transcripts. In situ hybridization (ISH) experiments showed that both alleles resulted in an increase in ptc1 transcripts. In addition, the blw tc294z mutant (Fig. 2F–H) shows milder upregulation than the ptc1 hu1602 mutant (Fig. 2I–K) at 18 hpf, again indicating that the latter allele is stronger. An alternative explanation for this observation might be that the splice donor mutation in ptc1 hu1602 increases the stability of the ptc1 transcript, subsequently resulting in a higher expression level after ISH. Therefore we analyzed the expression levels of gli1, another downstream transcriptional target of Hh signaling  to confirm the overactivation of the pathway in the ptc1 hu1602 mutant. The expression levels of gli1 at 19 hpf distinguishes wild types from heterozygotes and mutants (Fig 2L–N). This confirms that the pathway is indeed activated, and that the increase in ptc1 expression is not a consequence of altered stability of the transcript, due to the induced mutation, but a representation of the activity of Hh signaling in this mutant. 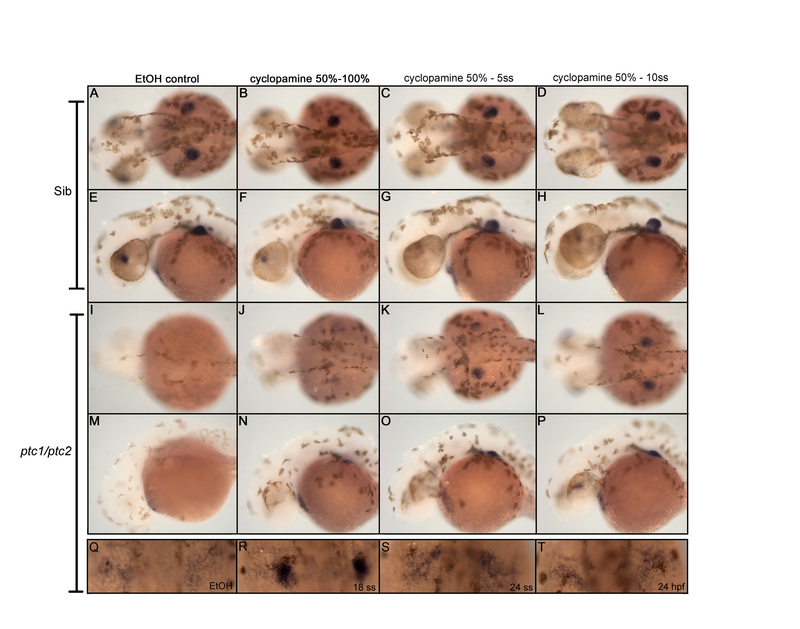 Phenotypic consequences of zebrafish ptc1 mutants. Homozygous ptc1 hu1602 mutants show a subtle somite phenotype at 32 hpf, where the average angle of the somite becomes more obtuse (A,B). 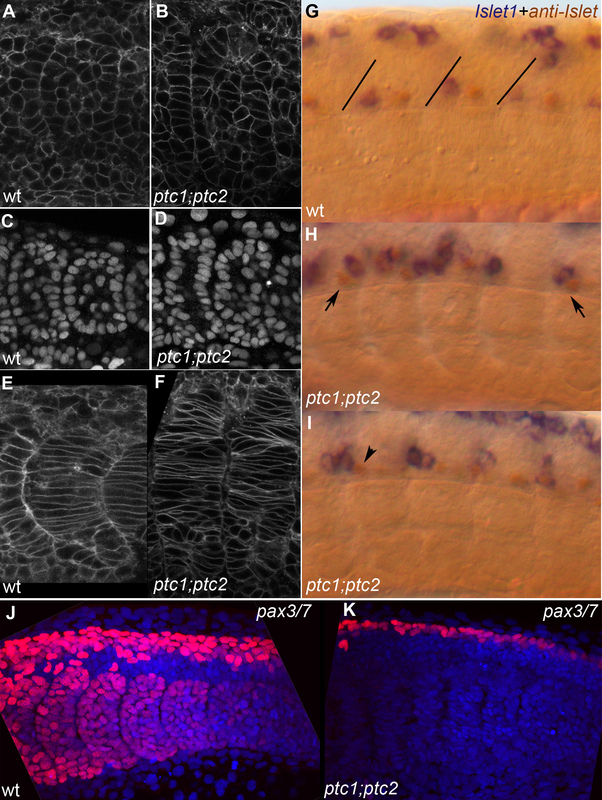 At 72 hpf, ptc1 hu1602 mutants exhibit an eye phenotype where the pigmented epithelium is extended into the diencephalon. The similar phenotype described for the blw mutant is weaker compared to the ptc1 hu1602 mutant (C-E). The expression level of ptc1, a general readout for Hh activity, shows a mild increase in the blw mutant compared to wild type (F-H). The ptc1 hu1602 mutant shows a severely increased level of ptc1, where wild types, heterozygotes and mutants can be distinguished based on ptc1 levels (I-K). Additional to the difference in the strength of the eye phenotype, the activation of the pathway is significantly higher in ptc1 hu1602 mutants compared to blw mutants. An increased expression level of gli1 confirms an activation of the Hh pathway in the ptc1 hu1602 mutant (L-N). The ptc1 hu1602 allele results in an in frame insertion of 27 amino acids into the protein sequence, and therefore we investigated whether this is a full null or a partial loss of function allele. To test this hypothesis we injected a MO against ptc1  into a ptc1 hu1602 mutant background, which did not enhance the phenotype. Additionally, we checked whether the ptc1 hu1602 allele has a dominant negative effect, by injecting wild type embryos with ptc1 hu1602 mRNA. No phenotypes comparable with the ptc1 hu1602 mutant were observed, excluding a dominant negative effect. Together the data suggest that ptc1 hu1602 is at least a strong loss of function allele. Since the ptc1 hu1602 allele is stronger than blw tc294z , we used this allele for subsequent analysis and therefore we will refer to ptc1 hu1602 when ptc1 is mentioned. By the identification of a zebrafish ptc1 mutant we are now able to investigate whether the inhibition of the pathway is dependent on the presence of both Ptc homologues. Based on the current model, the absence of both Ptc proteins will constitutively activate Smo, normally inhibited by Ptc, which in turn activates the entire downstream pathway. Double mutants for lep(ptc2) tj222 and ptc1 hu1602 were generated (hereafter referred to as ptc1;ptc2 mutants) and these were expected to show the consequences of increased Hh signaling. From previous studies it has been shown that overactivation of the Hh pathway, after injection of Shh or dnPKA [16, 25], results in a flattened somite phenotype. Phenotypically, ptc1;ptc2 mutants clearly exhibit a flattened somite phenotype at 18 hpf (Fig. 3A,B) confirming an activation of the pathway, by losing both Ptc homologues. At 24 hpf, the primitive eye field is present but the lens is missing (Fig. 3C,D), where at 48 hpf a complete absence of the eyes and the nose could be observed (Fig. 3E,F). To confirm an activation of the pathway we analyzed the expression level of nkx2.2a  and gli1 . The expression of nkx2.2a is only induced when Hh activity is high. A clear increase in nkx2.2a (Fig. 3G–J) ptc1 and gli1 (See Additional file 1) expression could be observed between the different genotypes, confirming that the activity of the Hh signaling pathway is severely upregulated in ptc1;ptc2 mutants. Administration of 10 mM of cyclopamine to ptc1;ptc2 partially rescued the phenotype and resulted in a decrease in ptc1 expression levels (data not shown). This confirms that the phenotype seen in ptc1;ptc2 mutants is a result of increased Hh pathway activation. Concurrent inactivation of ptc1 and ptc2 results in severe developmental defects. At 18 hpf, a somite phenotype becomes apparent in the ptc1;ptc2 double mutants, where the chevron shaped form of the somites becomes straight (A,B), which is a typical consequence of increased activity of the Hh pathway. At 24 hpf, ptc1;ptc2 double mutants do not develop a lens but the primitive eye field is still present (C,D). At 48 hpf the eyes are completely absent. Additionally, reduced pigmentation, an absence of the nose, and an underdeveloped ear can be observed at 48 hpf (E,F). Expression levels of nkx2.2a confirms that the pathway becomes more activated upon losing wild type alleles of ptc1 or ptc2, with the highest expression in the ptc1;ptc2 mutant, mainly in the anterior brain structures (G-J). The eye phenotype of a single ptc1 hu1602 mutant, a protrusion of the pigmented epithelium towards the medial region of the brain, could be a result of a disturbed balance between optic cup versus optic stalk differentiation. This process is reported to be under control of Hh signaling [17, 38]. Possibly, the absence of the eyes in the ptc1;ptc2 double mutants could be a further disturbance of cup versus stalk differentiation. To test this hypothesis, we analyzed the expression pattern of pax2 and pax6, identifying the presumptive optic stalk and cup respectively. Indeed, ptc1;ptc2 mutants expand pax2 expression and lose pax6 expression in the presumptive optic cup region (See Additional file 1), confirming a differentiation defect during eye development. Finally, ptc1;ptc2 mutants show an expansion of the lateral floor plate, indicated by foxa ISH, whereas shh expression in the medial floor plate was unaffected (See Additional file 1). Again, this is in line with previous reports , and confirms the overactivation of the Hh pathway in the ptc1;ptc2 mutants. These observations justify the assumption that the Hh pathway can be constitutively activated in a genetic manner, by losing activity of both Ptc homologues. In zebrafish, somites give rise to several muscle types. The earliest event concerns the formation of the adaxial cells, which will later go on to form the slow muscles, whereas the rest of the somite will mainly produce fast muscle. Adaxial cells that are located at the apex of the somite will become muscle pioneers, cells strongly positive for Engrailed (eng1) . Hh signaling from the midline induces both adaxial cells and muscle pioneers. As predicted by Hh injection experiments we find that both myod (Fig. 4A,B) and eng1 (Fig. 4C,D) [16, 25, 41] are strongly induced in ptc1;ptc2 mutants, indicating that these mutants mainly form slow muscle type fibers. Consistent with this somites appear to be elongated in the D/V direction and more cells appear to stack in the medial somite (See additional file 2). To gain further proof for a conversion of the myotome towards the slow muscle fate, we analyzed the expression of prdm1, known to be a key regulator for slow muscle cell differentiation . In a wild type situation, prdm1 is expressed in the most posterior somites and spinal cord neurons (Fig. 4E,F). The expression of prdm1 is regulated by Hh signaling , which is confirmed by the fact that the expression level increases in the ptc1 mutant, and to an even higher level in the ptc1;ptc2 mutants. This strongly suggests that the differentiation between fast and slow muscle cell differentiation in the myotome is shifted towards slow muscle type fiber formation, possibly by upregulating prdm1 expression. Upregulation of myoD correlates with upregulation of skeletal muscle alpha actin (acta1) gene expression as a marker for muscle differentiation, and downregulation of Pax3/7 expression (See Additional files 1 and 2) a marker for the undifferentiated dermomyotomal cells . Ptc1;ptc2 double mutants show mediolateral and anteroposterior somite patterning defects. Patterning of adaxial cells and slow muscle cell precursors is disturbed in ptc1;ptc2 mutants. The region of myod positive adaxial cells and eng1 expressing slow muscle precursors are expanded at 19 hpf (A-D). At 19 hpf, prdm1 expression is highly induced in the ptc1;ptc2 mutant, suggesting that the myotome is mainly developing slow muscle type precursors (E,F). Anteroposterior patterning of the somites is lost in segmented somites, since the posterior somite marker uncx4.1 (G,H) and anterior somite marker fgf8 (I,J) are strongly reduced or not detectable at 19 hpf. myf5 expression in 11 somite stage wildtype (K,L) and ptc1;ptc2 double mutant embryos (M,N). L and N are higher magnification of relevant areas of K and M, respectively. In wild type, myf5 is expressed at higher levels in the posterior of the somites during their formation, in more posterior (younger) segments this appears to include the adaxial cells (*). In more anterior (more mature) somites more anterior adaxial cells appear to show higher levels of labeling (arrowheads). In ptc1;ptc2 double mutant embryos (N) a "salt and pepper" type staining suggests that anterior and posterior cells are intermingled. Additionally, dlc necessary for proper segmentation is present in presomitic mesoderm but failed to be expressed in the posterior part of segmented somites (O,P), suggesting that somite formation and A/P patterning of formed somites are genetically uncoupled processes. Additionally, we also investigated whether the anteroposterior patterning of the somites was affected. Although myod is expressed in the posterior part of recently formed somites, the expansion of the adaxial domain of myod expression in ptc1;ptc2 mutants means that this marker cannot be used as A/P marker. Therefore, we analyzed uncx4.1, a marker whose expression is normally restricted to the posterior part of the somite, and surprisingly, we found that it was lost (Fig. 4G,H). In addition, expression of fgf8, which demarcates the anterior somite, was also lost (Fig. 4I,J), The loss of markers for both the anterior and posterior halves suggests that the somites have lost their polarity. Polarity defects are also corroborated by myf5 expression, which has a more complex expression pattern during somite maturation (Fig. 4K–N). Since A/P polarity of the somites is likely to be determined during- and in fact may be necessary for, proper somite formation (epithelialization) we analyzed the expression of deltaC (dlc) (Fig. 4O,P), her1 (data not shown), and cellular morphology (See Additional file 2). In wild types, the expression of these genes shows oscillation in the presomitic mesoderm and is required for proper segmentation. These markers showed a normal expression pattern in presomitic mesoderm. Furthermore, epithelialization does occur, albeit less regularly. Furthermore dlc expression showed that although it is normal in presomitic mesoderm and during somite formation, it is not maintained in the posterior part of older, more anterior somites (Fig. 4O,P). In an attempt to identify a link between increased Hh signaling and the loss of polarity markers, we analyzed a possible role for prdm1 in this process. Prdm1 can act as a transcriptional repressor, whose expression is controlled by Hh signaling . Morpholino knockdown of prdm1 did not rescue the expression of fgf8 or uncx4.1 (data not shown), indicating that additional negative regulators are involved in the loss of polarity markers in the ptc1;ptc2 mutant somites. All these data suggest that the somites of ptc1;ptc2 mutants become apolar after somite boundaries have been established. To our knowledge, this is the first instance in which the process of somite formation has been genetically uncoupled from A/P patterning of the formed somite. The Hh signaling pathway is known to regulate the formation and patterning of the vertebrate limb. However, Hh signaling is supposed to perform a rather late function in maintenance and outgrowth of the fin bud. Unexpectedly, the ptc1;ptc2 fin buds are completely lost. To investigate at which level Hh is acting on the induction of the fins, we investigated the expression pattern of several genes involved in fin development, like fgf24 and prdm1. Both genes were absent in the presumptive fin field (Fig. 5A–D). Additionally, the expression level of the transcription factor tbx5, one of the earliest markers for fin bud initiation was hardly detectable at 20 hpf, and a slight scattered expression was observed at 40 hpf (Fig. 5E–H). Initiation of tbx5 expression, labeling presumptive heart and pectoral fin primordia appeared normal, however (See Additional file 1). Hand2 (or dHAND) is another important factor in limb bud formation in zebrafish . The expression of tbx5 and hand2 is mutually dependent since hand2 expression is reduced in tbx5 mutants and tbx5 expression is reduced in hand2 mutants [43, 44]. We therefore tested whether we could see defects in hand2 expression. ISH at 20 hpf, shows the expected expression pattern of hand2 in posterior lateral mesoderm with a subtle difference in the future fin bud region where hand2 is absent (Fig. 5I–L). Published analysis of early stages of fin bud formation suggests that tbx5 is only mildly reduced in a hand2 mutant and fin buds are still formed . The strong reduction of tbx5 in ptc1;ptc2 mutants suggests that although hand2 is reduced it is probably not the only causal factor. Since both hand2 and tbx5 are reduced we sought to identify defects in signals that might act upstream of these two genes. One factor that has been implicated in tbx5 expression is wnt2b , however no difference could be observed in wnt2b expression at 18 hpf (See Additional file 1). Finally, fin bud induction is known to be under direct control of RA signaling, as shown by the neckless (nls) mutant encoding aldh1a2 . Furthermore, mouse Aldh1a2 -/- embryos neither express tbx5 nor hand2 . Manipulation of RA signaling in the nls mutant, has shown that it is required before 10 somite stage (ss)  for development of the pectoral fin bud, as indicated by dlx2 expression. Additionally, RA signaling has also been shown to be necessary during early segmentation, when it is produced in the anterior somites, to induce the fin field , where it rescues tbx5 expression in the neckless mutant. In the ptc1;ptc2 mutant aldh1a2 expression, required for the production of RA, was not significantly altered at the 60% epiboly stage or at 18 somites in ptc1;ptc2 double mutants (data not shown). In an attempt to rescue the fin phenotype, we treated double mutant embryos with RA. Concentrations ranging from 10-7 to 10-6 M did not rescue the formation of the pectoral fins (n = 60 per concentration, including 3 to 4 ptc1;ptc2 mutants). However, the expected morphological defects in axis formation were obtained, showing that RA can signal in the ptc1;ptc2 mutants. We conclude that the Hh signaling pathway represses induction of the fin bud, and acts independent of RA signaling. Hh signaling has an early negative role in the induction of the fin field. Expression analysis of fgf24 and prdm1 in a wild type embryo shows that these genes are restricted to the fin field at 26 hpf (A,C). ptc1;ptc2 mutants do not express these markers confirming that aberrant activation inhibits fin bud formation (B,D). To determine at which level Hh is inhibiting fin formation, the expression of tbx5, one of the earliest markers expressed in the finbud, was analyzed. At 20 hpf (E,F) tbx5 expression is lost in the presumptive finbud region (scale bar 100 μm). At 40 hpf (G,H), the fin bud has established and tbx5 expression is restricted to the pectoral fin in a wild type situation. However, in the ptc1;ptc2 double mutant a scattered low expression can be observed, showing that the pectoral fin bud is not formed. At the 10 ss, however, the initial expression domain of tbx5, encompassing heart and fin primordia is established. hand2, acting upstream of tbx5 is not expressed in the future pectoral fin area (I-L: white arrow), suggesting a very early negative role for Hh signaling in fin bud induction. Since the expression of wnt2b is not affected in the ptc1;ptc2 mutants and exogenous RA treatment is unable to rescue the fin phenotype, we tried to determine in which time window Hh is preventing fin field induction. Therefore, we treated 90 embryos, obtained from a ptc1+/-;ptc2+/- incross, with 10 μM cyclopamine between 50% epiboly and different developmental stages. This concentration of cyclopamine does not severely affect wild type siblings. By using this rather low concentration we do not affect the later role for Hh in outgrowing of the fin bud, but specifically focus on its supposed early role in fin bud induction. As a readout for a possible rescue, we examined tbx5 expression at 40 hpf, showing a clearly distinct finbud in the wild types (Fig. 6A–D,E–H) and an absence of tbx5 in the ptc1;ptc2 mutant (Fig. 6I,M). Transient inhibition of Hh by cyclopamine between 50% and 100% epiboly (Fig. 6B,F,J,N) did not re-establish a localized tbx5 expression in the presumptive fin field. However, low tbx5 expression could be detected, in contrast to the untreated ptc1;ptc2 mutant (Fig. 6I,M). Localized expression of tbx5 was detected when Hh was inhibited between 50% epiboly and 5 ss (Fig. 6K,O). This can be enhanced when ptc1;ptc2 mutants are treated with cyclopamine between 50% and the 10 ss (Fig. 6L,P). Thus inhibiting Hh signaling during early segmentation stages clearly rescued tbx5 expression in the fin field. However, it is not clear how quickly the cyclopamine is washed out. Furthermore no obvious outgrowth of the pectoral fin bud was observed in these embryos at 40 hpf, which indicates that high levels of Hh signaling can still inhibit pectoral fin outgrowth after the 10 ss in the ptc1;ptc2 mutant. To further investigate the time window in which Hh is negatively regulating fin induction, we treated embryos with 10 μM cyclopamine from 12 ss, 18 ss, 24 ss and 24 hpf towards 40 hpf (Fig. 6Q–T). Restricted expression of tbx5 can only be rescued when Hh activity is inhibited starting from the 12 (data not shown) or 18 somite stage (Fig. 6R). Adding cyclopamine at 24 ss or 24 hpf results in a scattered tbx5 expression (Fig. 6S,T) which is nearly similar to the untreated ptc1;ptc2 mutants (Fig. 6Q). These experiments suggest that Hh signaling is inhibiting recruitment of tbx5 positive cells during the segmentation period (from 100% epiboly until 24 somite stage). During this time, the closest source of potential Hh signaling is at the midline. The normal fin primordium is located approximately 130-150μm, this is somewhat further than the estimated active range of midline hedgehog signaling (in chick neural tube approximately 100μm ) and would suggest such signals would normally not occur in the fin region. Cyclopamine treatment determines time window where Hh signaling inhibits fin induction. Treatment with 10 μM cyclopamine between 50% epiboly and the indicated developmental stages, identified the critical time window for Hh where it actively inhibits fin induction. From a dorsal (A,D, I-L) and lateral (E-H, M-P) view recruitment of tbx5 positive cells in the fin field can be slightly rescued when cyclopamine is administered between 50%- and 100% epiboly (J,N). However, tbx5 is more highly expressed when cyclopamine is administered between 50% epiboly and 5- and 10 somite stage (K,L,O,P). The constitutive activation of Hh signaling after removing cyclopamine, inhibits the outgrowth of the fin bud, clearly visible from a lateral view (M-P). Inhibiting Hh signaling in ptc1;ptc2 double mutants from the 18 ss till 40 hpf, rescues a restricted expression of tbx5, which is not, observed when cyclopamine is administered at 24 ss or 24 hpf (Q-T). These data show that Hh signaling inhibits fin induction during late gastrulation and the segmentation stage. Our previous research has shown that the Hh signaling pathway is strictly controlled in zebrafish to prevent overactivation, since the concurrent loss of Sufu, Hip and Ptc2 does not result in the severe morphological defects , that have been described for Hh overactivation. We previously hypothesized that a combined loss of both Patched proteins should result in a constitutive activation of the Hh pathway. Contrary to Ptc2, there was no zebrafish Ptc1 mutant available to confirm this idea. Here we report the identification of a zebrafish Ptc1 mutant via a reverse genetic approach. The identified splice donor mutation, results in the insertion of intron 10 consisting of 81 base pairs into the transcript, enlarging the second extracellular loop of the protein by 27 amino acids and the inserted amino acid sequence has no homology to known proteins or domains. Previous reports have described that the first and fourth extracellular loops are required to bind Hh . There are two likely explanations for the observed effect. Firstly, the modified protein is not inserted correctly in the membrane, and can therefore not exert its normal function. An alternative possibility is that the extended loop mimics the effect that Hh binding normally has, or that it somehow affects the sterol-sensing domain. This scenario might result in a correctly localized protein, which would however, lose its repressive capacity on Smoothened. Although the consequence of this insertion on a protein level is hard to predict, the Hh pathway is clearly constitutively activated, since ptc1, nkx2.2a and gli1 expression are severely increased in ptc1 hu1602 mutants. Zebrafish mutants homozygous for ptc1 hu1602 , show a somite defect, as expected from Hh overexpression experiments, where the angle of the somite becomes more obtuse. However, the strength of the phenotype is surprisingly mild, since mouse data suggest that Ptc1 is the main inhibitor of Hh signaling. In mice, ptc1 knockouts are embryonic lethal  and ptc2 mutants are viable without obvious defects , indicating that Ptc1 is the major regulator in mammals. This could indicate a functional shift between zebrafish and the mouse homologues of Ptc. This shift may also be reflected by the fact that the comparisons between the mouse and fish genes does not result in a clear one-to-one relationship between the Ptc1 and Ptc2 homologs . 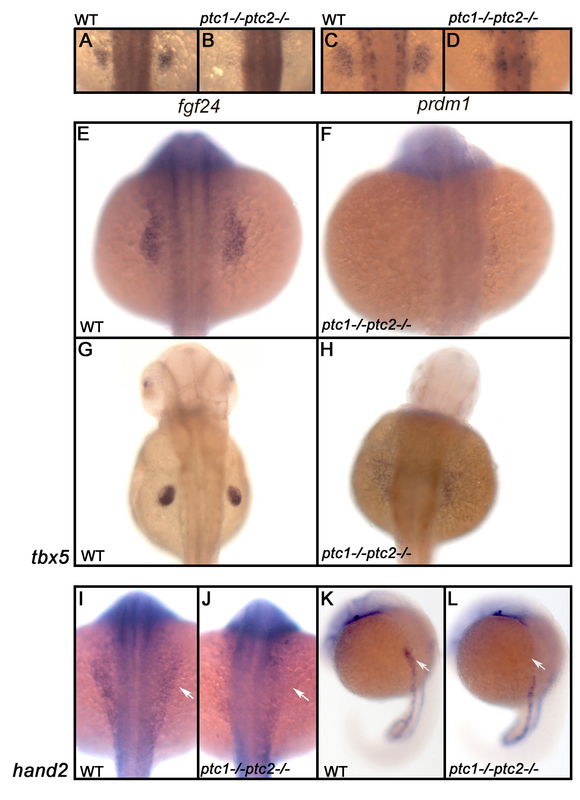 The ptc1 mutant enabled us to confirm our hypothesis that in zebrafish Ptc1 is the key negative regulator of the Hh pathway, conferring a stronger phenotype than the triple mutant made with Sufu, Hip and Ptc2. The ptc1;ptc2 double mutants showed the expected flat somite phenotype, which is the classical effect of Hh overexpression. Additionally, mutants homozygous for both the ptc1 hu1602 and uki(hip) hu418B mutations also resulted in flattened somites confirming the idea that ptc1 expression is induced above a certain activity, thereby preventing the pathway from further activation (data not shown). This is a likely scenario since subtle increases in ptc1 expression could be observed in ptc2 and hip mutants , confirming the idea that Ptc1 has a pivotal role in controlling the activity of the pathway. The constitutive activation of the pathway in ptc1;ptc2 double mutants results in similar phenotypes as described after injection of shh or dnPKA, concerning the optic stalk versus cup differentiation in the developing eye, patterning of the floor plate and differentiation of fast and slow muscle cell types, thereby validating these mutants as a model system to study the consequences of aberrantly activated Hh signaling. Somite A/P information has previously been shown to be necessary for proper segmentation [13, 51]. In the zebrafish mutants fused somites (fss) , anterior information is lost and the complete somite is posteriorized , resulting in the lack of somite boundary formation. When anterior and posterior polarity genes are expressed throughout the complete somite, segmentation is disturbed. This has been shown for the beamter (bea), deadly seven (des) and after eight (aei) mutants , which do only form the first four, seven and eight somites respectively, as a consequence of mutated components of the Notch signaling pathway [52, 53]. The A/P axis is thought to be established in the presomitic mesoderm, and is thought to be required for morphological boundary formation . The ptc1;ptc2 mutants show that A/P patterning in the presomitic mesoderm/nascent somite can be separated from maintenance of A/P patterning in existing somites. We analyzed expression of her1 and dlc in the presomitic mesoderm and found no defects, indicating that the oscillations in their expression occur normally. This is confirmed by a normal morphological progression of somitogenesis in double mutants. From the known role of Hh signaling in paraxial mesoderm, and myod labeling experiments, we expect that the paraxial mesoderm is completely induced to become adaxial. We conclude that adaxial cells are capable of executing the oscillations required for segmentation and are capable of forming somite boundaries. However, analysis of dlc has shown that the somites are not able to maintain the A/P pattern in the somites. Surprisingly, such somites do not show a default A or P identity, rather they appear to be apolar (loss of fgf8/anterior; uncx4.1/posterior). Since the Hh signaling pathway leads to activation of transcription via the Gli genes, repression of the former genes has to occur via intermediate repressors. prdm1 was tested as an good candidate, but morpholino-knockdown of this gene could not rescue fgf8 or uncx4.1 expression, indicating that additional repressors are induced. Since we have tested only a limited set of markers we cannot exclude that the somites have some currently undetectable A/P polarity. Most markers that show A/P differences are not expressed in the adaxial cells or are expressed in all adaxial cells without displaying A/P differences. Thus it might be assumed that polarity is lost because adaxial cells do not participate in this patterning, and Hh signaling from the midline induces adaxial fates. Loss of hh signaling has not been shown to affect somite A/P patterning, thus such a interference model appears attractive. Even though the effect on myf5 expression suggests that A/P is directly by the hh signal, our data currently cannot exclude an indirect model where premature muscle differentiation prevents expression of such markers. Somite A/P pattern has been reported to guide patterning of the motoneurons of the neural tube . In mutants ptc1;ptc2 neural tube patterning itself is affected by ectopic Hh signaling, thus in order to study this tissue specific knockouts are required. Nevertheless, we find defects that are at least consistent with defects in A/P patterning (See Additional file 2). One of the most surprising phenotypes of the ptc1;ptc2 double mutant is the absence of the pectoral fins. Thus far, only a positive role for Shh signaling in limb development has been described, and this function is supposed to be later in development after the establishment of the limb bud [55–58]. Indeed, zebrafish mutants that abolish Hh signaling, like syu or smu, do have fin buds, but these fail to grow out [35, 59, 60]. Although Shh is required late in limb formation, Gli3, a downstream component of the Hh pathway, may act earlier. This has been shown convincingly by several reports [61–63]. The results indicate that the repressor form of Gli3 (Gli3R) prevents expression of hand2 in the anterior limb bud, thereby prepatterning this structure. According to this model activation of Hh signaling should lead to processing of Gli3R to Gli3Act and hand2 should become expressed in the anterior limb bud. This leads to expansion of posterior genes and ectopic shh expression. Morphologically it should lead to polydactylous limbs rather than absence of limbs, similar to what has been observed in mouse Gli3 deficient limbs. This is in fact the opposite of what we find in ptc1;ptc2 double mutants. We find that hand2 is suppressed and that shh expression is lost in the prospective fin bud. One possible explanation for this discrepancy is that there are evolutionary differences between fish and more advanced vertebrates. Therefore, it will be interesting to create a mouse ptc1;ptc2 double mutant to test whether the findings from zebrafish hold up in mammals. Recently, a mouse ptc2 mutant has been generated , but since the Ptc1 mutant  is embryonic lethal, more sophisticated inducible mutants should be generated to test whether our finding on fin induction are conserved in mammals. Retinoic acid may have an early role in establishing the fin bud territory, since RA has been found to affect tbx5 and hand2 expression. During segmentation, RA formed in the first few somites is necessary to induce fin induction with a critical time window between gastrulation and 12 hpf . We have not found any evidence that the effect of Hh acts through a RA signal. The expression of aldh1a2 is not altered by Hh activation and exogenous RA does not rescue pectoral fin formation. Furthermore, wnt2b acts downstream of RA to establish the pectoral fin territory, and its expression is also unaffected in the ptc1;ptc2 mutant. Our results suggest that Hh signaling may have a very early negative effect on the establishment of the fin field in the zebrafish. At the 10 somite stage when tbx5 expression is just established [65, 66] and normal in double mutants, we find ptc2 expression both in the somites and lateral plate, whereas ptc1 is only detectable in the somites, however, in ptc1;ptc2 double mutants ptc1 becomes expressed more laterally as well (See Additional file 1). Thus it is possible that Patched proteins function around this stage in the fin primordium to maintain tbx5 expression. This does not exactly fit with our data that cyclopamine rescues already at the 50%- 5 somite stage. However, rapid development, in combination with perdurance of the cyclopamine after wash-out could account for this. It might be possible that Hh signals from the midline could put a limit to the fin bud territory at the medial side. However such a model would imply that loss of Hh signaling should lead to an increase in the tbx5 expression domain towards the midline, which has not been reported . To accommodate for this, such a model would require a second unknown signal that inhibits expansion in parallel to Hh. An alternative explanation would be that a subset of cells in the somites is transformed into adaxial cells/slow muscle, or intermediate mesoderm could be affected. As a result of this transformation a cell type may be lost that is capable of inducing the pectoral fin primordia, or gain a signal that blocks formation of these primordia, creating a neomorphic phenotype. Indeed, the lbx1 positive population of premigratory limb muscle cells is lost in ptc1;ptc2 mutants (See Additional file 1), but there is currently no evidence that these particular cells are required to form a limb bud in mice or fish [67, 68] Again this model would require postulation of a second unknown signal. In the case of a positive signal, it would be required parallel to the "RA/Wnt2b" signal. Elegant experiments from Gibert et al. , suggest that there is no second positive signal from the somites, since application of RA in embryos in which the paraxial mesoderm is genetically ablated can induce early fin markers. We currently favor the first model where Hh signaling can inhibit tbx5 directly in the fin primordia but that this is normally redundant and may help to make pectoral fin development more robust. Transplantation experiments may help to resolve where ptc1 and ptc2 exert their inhibitory function through the somites or directly in fin primordium, but such experiments will be challenging due to the low frequency of ptc1;ptc2 double mutants, and the inability to identify such animals at the stage these experiments are normally performed. 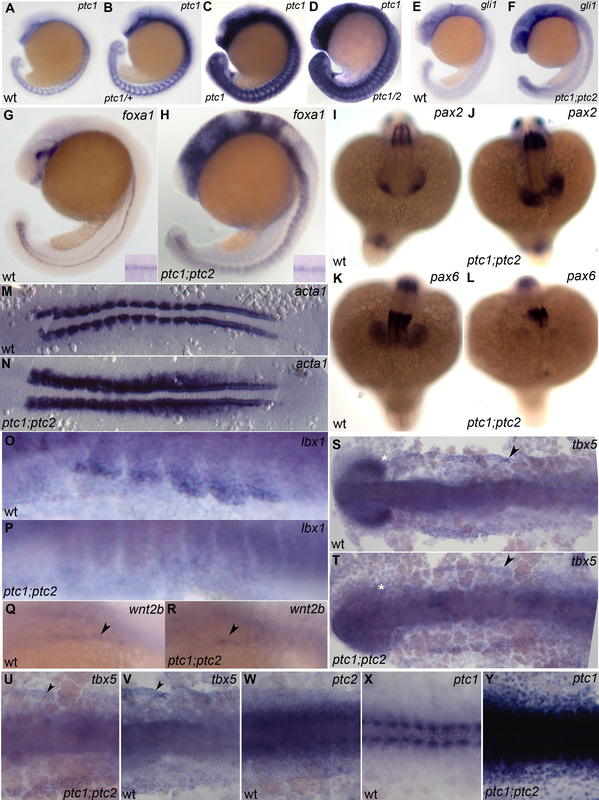 Altogether, this report describes the identification of two zebrafish ptc1 mutants and two novel and unexpected roles for Hh signaling during development, as observed in the ptc1;ptc2 mutant. Using this model system, we are now able to study the consequences of constitutive activation of Hh signaling during vertebrate development, in a stable genetic manner, which will be important for fully understanding the role of Hh during development and disease. Zebrafish were maintained and staged according to standard protocols . Zebrafish lines used: ptc1 hu1602 , lep tj222 , blw tc294z . An ENU induced mutation library was screened for Ptc1 mutants, analyzing an amplicons covering exon 9–12, using the TILLING protocol . Primer sequences can be obtained upon request. MOs for Ptc1 and LynGFP mRNA (a kind gift of R. Kim) were injected at the 1-cell stage according to  in a range from 0.5 to 3 ng for the MO and approximately 1 nl of 25 ng/μl for LynGFP. Prdm1 MOs were injected according to Baxendale et al, 2004 . ISH experiments were performed as described in Thisse et al, 1993 . The following probes where generated according to the indicated articles: ptc1 , fgf8 , myod , tbx5 , hand2 , uncx4.1 , eng1 , dlc ), dlx2 , gli1 , foxa1 , ptc2 , shh , islet1 , acta1 (a gift of S. Baxendale), pax2, pax6 , lbx1 . The prdm1 and nkx2.2a probes were generated from PCR product, using T3-tailed primers and subsequent transcription with T3-RNA polymerase. Whole mount immunohistochemistry was performed according to standard protocols  we used a pan-islet monoclonal antibody 39.4D5 (Developmental Studies Hybridoma bank) and monoclonal DP312  to label pax3/7 cells  Pax3/7 was detected using Cy3 conjugated donkey anti-mouse secondary antibody (Jackson Immuno Research), mounted in Vectashield+DAPI (Vector Labs) and viewed under a Zeiss LSM510 confocal microscope. Progeny of ptc1 hu1602 /+ ; lep(ptc2)+/- was treated with all-trans RA as described before . Concentrations were ranging from 10-6 to 10-7 M, diluted from a 10-2 M stock in DMSO. Embryos were treated and analyzed from 4 hpf till 48 hpf. Genotypes were determined subsequently on the complete clutch to confirm the presence of ptc1;ptc2 double mutants. Cyclopamine was dissolved in 96% EtOH to a concentration of 10 mM. Zebrafish embryos were treated from 5.5 hpf with varying concentrations of cyclopamine and controls with an equal volume of 96% EtOH. We would like to acknowledge Josine Mudde, José van de Belt, and Saskia Houwing for library screening and Carina van Rooijen and Hiljanne van der Meer for technical assistance. We thank Dr. D. Zivkovic, Dr. S. Schulte-Merker, Dr. K. Hammond and Dr. H. Roehl for critically reading this manuscript, and S. Elworthy for discussions. M.J. Koudijs was supported by NWO genomics grant 050-10-024. MJK conducted most of the experiments and wrote the article. MJB and EG performed experiments. FJE conceived of the study, and participated in its design and coordination and helped to draft the manuscript. All authors read and approved to the final manuscript.